The little hamlet of Anderson was named for Mr. John Anderson who was a Director in the South Western Railroad at the time it was extended from Oglethorpe to Americus in 1853. It was known as Anderson Station until the post office was established in November 1855 and the government changed the name of the station from “Anderson” to “Andersonville” in order to avoid confusion with the post office in Anderson, South Carolina. During the Civil War, the Confederate army established Camp Sumter to house incoming Union prisoners of war. The town served as a supply depot during the period, and it included a post office, a depot, a blacksmith shop and stable, a couple of general stores, two saloons, a school, a Methodist church, and about a dozen houses. (Ben Dykes, who owned the land on which the prison was built, was both depot agent and postmaster.) In 1974, long-time mayor Lewis Easterlin and a group of concerned citizens decided to promote tourism in the town by turning the clock back and making Andersonville look much as it did during the American Civil War. Now today Andersonville offers many different sights to see. It is home to the Drummer Boy Civil War Museum which has authentic uniforms, both Union and Confederate, an extensive collection of Union Gen. Thomas T. Eckert. Lincoln conspirator, Mary Surratt’s bonnet and other rarities make this a national gem. Pioneer Farm is a five acre park that is open daily to the public that offers views of what life was like during the late 1800’s with an operating Grist Mill, a 167 year-old log cabin and a blacksmith shop. 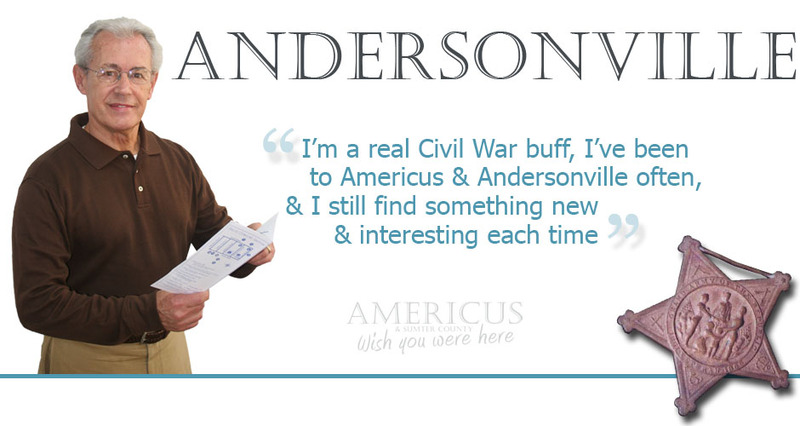 Andersonville welcomes tourists from all over the world who come for the history and to step back in time. Visit Andersonville National Historic Site, operated by the National Park Service, and tread the solemn ground marking the site of the Civil War’s largest prison where nearly 13,000 Union soldiers died. The story of captivity is told in the National Prisoner of War Museum at Andersonville. Andersonville National Historic Site is the only park in the National Park System to serve as a memorial to all American prisoners of war throughout the nation’s history. The 495-acre park consists of the historic prison site and the national cemetery. Congress stated in the authorizing legislation that this park’s purpose is “to provide an understanding of the overall prisoner of war story of the Civil War, to interpret the role of prisoner of war camps in history, to commemorate the sacrifice of Americans who lost their lives in such camps, and to preserve the monuments located within the site”. In 1998 the National Prisoner of War Museum opened at Andersonville, dedicated to the men and women of this country who suffered captivity. Their story is one of sacrifice and courage. Visit the original prison site with rebuilt stockade wall sections and remnants of escape tunnels, the Civil War cemetery, and the National Cemetery.